I spoke to Jeff Finley, a retired NHL player who makes his home in Kelowna, about the NHL coming back to Winnipeg. 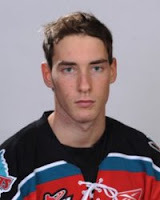 Finley is a former assistant coach with the Kelowna Rockets and is now a scout with the NHL's Detroit Red Wings. Finley is a former Winnipeg Jets defenceman, suiting up for just one season during the 1995-96 campaign. Finley had these thoughts about the NHL returning to the Manitoba capital. "I was there for just one season but I enjoyed my time there. The people there are fantastic. They are die hard hockey fans. It is great for Canada to have another NHL team. It's called friendly Manitoba for a reason and their are truly great people there." Finley remembers the sad faces in the Winnipeg Arena as the team said goodbye in their final home game. "It was a story that carried on all year. The fans knew the team was going to move. It was inevitable at the end of the season. You definitely felt their pain. You knew how upset they were that they were losing their team. You really felt it in the playoffs. They had the famous white out there and we had a great six game series with the Detroit Red Wings and the fans were outstanding. I have, never to this day, been in a building that was that loud in Winnipeg." Why will the NHL work in Winnipeg this time? "I compare it to the situation in Minnesota. When I played in the league years ago, Minnesota had a team and their were often night's where we went in there and they couldn't have had more than four or five thousand people in the building. The team ended up moving to Dallas but years later they got an expansion franchise back in Minnesota, with a brand new building, and now you can't get a ticket." Will players been enthused in playing in Winnipeg? "It doesn't sound great. It was tough. I enjoyed it there but the winter's there are miserable. It's freezing cold like everybody knows. Players won't be overly excited about the weather but the opportunity to play back in Canada where its hockey everyday will get them excited. They are making lots of money..they will be fine going back to Winnipeg." As for a new name for the team, Finley doesn't have a problem with them keeping it as is by calling them the 'Winnipeg Jets'. The 22 year-old knew the Ice had the potential of winning a Western Hockey League title. Unfortunately for him, they did it a season after he graduated as one of three overage players. The Kelowna resident was part of the process, but would have liked nothing more than enjoying the fruits of Kootenay's labour in winning the league crown this season. 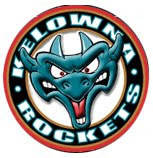 The Kelowna residents birth certificate proved to be the stumbling block as he watched the teams magic ride through the post season from afar. Sylvester spent five seasons with the Kootenay Ice and captained the team in his 20 year-old season. Outside of just four players currently on the Ice' roster, Sylvester went to battle with all of them. "Pretty much everyone was coming back from last year, so it is the luck of the draw that I was there for five years and this was their year to do it. I kinda missed out, but I have a lot of good friends on that team and am glad to see them go that far". Sylvester led the Ice in scoring (35+58=93) in 2009-2010, but admits the organizations always preached work ethic over individual results. "I think it shows how good of a team they were when you look at the stats. When you have four guys with 27 points in the playoffs, you can't complain with that". Sylvester is one alumnus that would encourage other players concerned about playing in the CHL's second smallest centre to put those fears behind them. "Kootenay hasn't missed the playoffs in what, ten or 11 years or something? 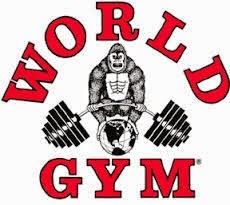 I enjoyed playing there. It is a small team....it isn't a big city so the guys are really close. The furthest guy from you is about a five minute drive. That is one of the reasons alone why they have been so successful". Sylvester played this past season in Europe but is contemplating whether to return or play North American hockey this fall. The Kelowna Rockets will bid to host the 2013 Memorial Cup. The Rockets will join Red Deer, Prince George, Lethbridge and Saskatoon as teams that have confirmed they will make bid presentations to WHL governors in October. The Rockets hosted the Memorial Cup in 2004 while Saskatoon previously hosted the event in 1989. Lethbridge and Red Deer have never hosted the ten day tournament. Rockets General Manager Bruce Hamilton (pictured), is in Mississauga representing the WHL as the Chairman of the Board. The Kelowna Rockets will make two selections in next months Canadian Hockey League import draft. The Rockets have parted ways with 19 year-old Andreas Stene and 18 year-old Gal Koren. Stene (pictured far right) scored just two goals in 55 regular season games despite captaining Norway at the World Junior Hockey Championships. Stene participated in just four playoff games. Koren saw limited ice time, playing in 33 regular season games where he scored just one goal. Koren also played for Slovenia in Division 1 at the WJC. Koren saw action is just three games in the post season. The Kelowna Rockets went to Saskatchewan for their first two picks in today's WHL bantam draft in Calgary. In round one, 15th overall, the Rockets picked forward Rourke Chartier from Saskatoon. I spoke to Chartier about how he heard the news he was drafted by the Rockets. "Our teachers are all on strike so we didn't have school today. It worked out pretty good. Otherwise I would have been at school, so we just watched it on the webcast". Oddly enough Chartier's parents are both teachers and were on the picket lines when the news came down that he was headed to Kelowna. 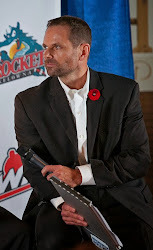 Chartier's father, Marc, is the head coach of the Saskatoon Contacts, the team Rourke will play with next season before hopefully earning a spot with the Rockets as a 16 year-old. Marc Chartier played with the Saskatoon Blades and Billings Bighorns in the late 70's before spending time with the University of Saskatchewan Huskies. In round two, the Rockets picked forward Austin Glover 37th overall. It was neat to see Kelowna resident Dixon Ward recieving some TV time during the Canucks opening round playoff series against Chicago. 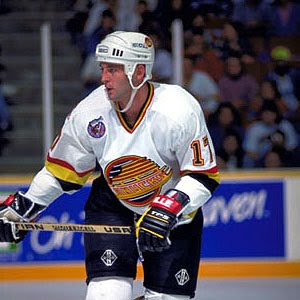 Ward, who was originally drafted by the Canucks in 1988, was providing post game analyse on Rogers Sportsnet following the Canucks game seven win. 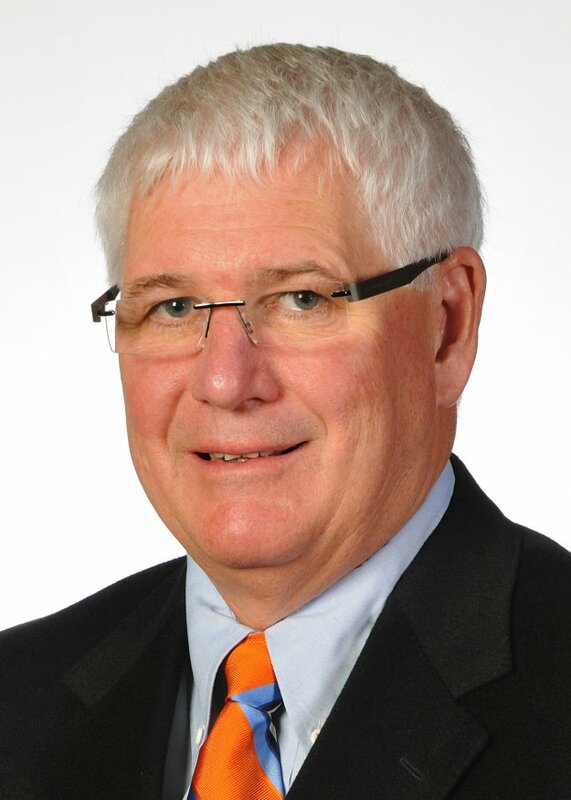 Ward spends the majority of his time in Kelowna as the Vice President of the Okanagan Hockey Schools and Academy. I spoke to Ward last week about playoff pressure, and if in fact it does exist. "To be honest with you, the players don't feel the same pressure as the people watching feel. It's hard for people to understand that. They (players) have played so many hockey games and so many important hockey games in their life before they even get to this level, so they are just focused on playing. They don't feel tremendous pressure. There is a lot of anxiety and you are anxious and excited but its a very enjoyable time of the year. It's always a favourite time of the year for many reasons. 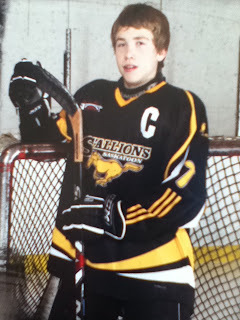 The number one reason is it is hockey all day every day and that's fun for a player. The rest of life gets pushed to the side for a couple of months and you are focused on one thing and one thing only. The people watching it have more anxiety because they have no control over it."